Samuel Beckett Bridge, Convention Centre, Trinity College, O'Connell Bridge, The Custom House, Dublin Castle. Dublin (/ˈdʌblɪn/, Irish: Baile Átha Cliath [blʲaːˈklʲiəh]) is the capital and largest city of Ireland. Dublin is in the province of Leinster on the east coast of Ireland, at the mouth of the River Liffey and bordered on the South by the Wicklow Mountains. The city has an urban area population of 1,173,179. The population of the Greater Dublin Area, as of 2016, was 1,904,806 people. As of 2010, Dublin was listed by the Globalization and World Cities Research Network (GaWC) as a global city, with a ranking of "Alpha-", which places it amongst the top thirty cities in the world. It is a historical and contemporary centre for education, the arts, administration, economy and industry. The name Dublin comes from the Irish word Dubhlinn, early Classical Irish Dubhlind / Duibhlind, dubh /d̪uβ/, alt. /d̪uw/, alt /d̪u:/ meaning "black, dark", and lind /lʲiɲ[d̪ʲ] "pool", referring to a dark tidal pool. This tidal pool was located where the River Poddle entered the Liffey, on the site of the castle gardens at the rear of Dublin Castle. In Modern Irish the name is Duibhlinn, and Irish rhymes from Dublin County show that in Dublin Leinster Irish it was pronounced Duílinn /d̪ˠi:lʲiɲ/. The original pronunciation is preserved in the names for the city in other languages such as Old English Difelin, Old Norse Dyflin, modern Icelandic Dyflinn and modern Manx Divlyn as well as Welsh Dulyn. Other localities in Ireland also bear the name Duibhlinn, variously anglicized as Devlin,  Divlin  and Difflin. Historically, scribes using the Gaelic script wrote bh with a dot over the b, rendering Duḃlinn or Duiḃlinn. Those without knowledge of Irish omitted the dot, spelling the name as Dublin. Variations on the name are also found in traditionally Gaelic-speaking areas of Scotland (Gàidhealtachd, cognate with Irish Gaeltachta), such as An Linne Dhubh ("the black pool"), which is part of Loch Linnhe. It is now thought that the Viking settlement was preceded by a Christian ecclesiastical settlement known as Duibhlinn, from which Dyflin took its name. Beginning in the 9th and 10th century, there were two settlements where the modern city stands. The Viking settlement of about 841, Dyflin, and a Gaelic settlement, Áth Cliath ("ford of hurdles")  further up river, at the present day Father Mathew Bridge (also known as Dublin Bridge), at the bottom of Church Street. Baile Átha Cliath, meaning "town of the hurdled ford ", is the common name for the city in modern Irish. Áth Cliath is a place name referring to a fording point of the River Liffey near Father Mathew Bridge. Baile Átha Cliath was an early Christian monastery, believed to have been in the area of Aungier Street, currently occupied by Whitefriar Street Carmelite Church. There are other towns of the same name, such as Àth Cliath in East Ayrshire, Scotland, which is Anglicised as Hurlford. Dublin celebrated its 'official' millennium in 1988 AD, meaning that the Irish government recognised 988 AD as the year in which the city was settled and that this first settlement would later become the city of Dublin. It is now thought  that the Viking settlement was preceded by a Christian ecclesiastical settlement known as Duibhlinn, from which Dyflin took its name. Beginning in the 9th and 10th century, there were two settlements which later became the modern Dublin. The subsequent Scandinavian settlement centred on the River Poddle, a tributary of the Liffey in an area now known as Wood Quay. The Dubhlinn was a small lake used to moor ships; the Poddle connected the lake with the Liffey. This lake was covered during the early 18th century as the city grew. The Dubhlinn lay where the Castle Garden is now located, opposite the Chester Beatty Library in Dublin Castle. Táin Bó Cuailgne ("The Cattle Raid of Cooley") refers to Dublind rissa ratter Áth Cliath, meaning "Dublin, which is called Ath Cliath". Dublin was established as a Viking settlement in the 10th century and, despite a number of rebellions by the native Irish, it remained largely under Viking control until the Norman invasion of Ireland was launched from Wales in 1169. It was upon the death of Muirchertach Mac Lochlainn in early 1166 that Ruaidrí Ua Conchobair, King of Connacht, proceeded to Dublin and was inaugurated King of Ireland without opposition. Arguably, he was the primitive undebated full king of Ireland and also the only Gaelic one. The King of Leinster, Diarmait Mac Murchada, after his exile by Ruaidhrí, enlisted the help of Strongbow, the Earl of Pembroke, to conquer Dublin. Following Mac Murrough's death, Strongbow declared himself King of Leinster after gaining control of the city. In response to Strongbow's successful invasion, King Henry II of England reaffirmed his sovereignty by mounting a larger invasion in 1171 and pronounced himself Lord of Ireland. Around this time, the county of the City of Dublin was established along with certain liberties adjacent to the city proper. This continued down to 1840 when the barony of Dublin City was separated from the barony of Dublin. Since 2001, both baronies have been redesignated the City of Dublin. 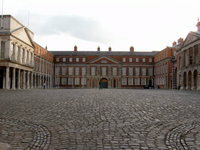 Dublin Castle was the fortified seat of British rule in Ireland until 1922. Dublin grew even more dramatically during the 18th century, with the construction of many new districts and buildings, such as Merrion Square, Parliament House and the Royal Exchange. The Wide Streets Commission was established in 1757 at the request of Dublin Corporation to govern architectural standards on the layout of streets, bridges and buildings. In 1759, the founding of the Guinness brewery resulted in a considerable economic gain for the city. For much of the time since its foundation, the brewery was Dublin's largest employer. Dublin suffered a period of political and economic decline during the 19th century following the Acts of Union 1800, under which the seat of government was transferred to the Westminster Parliament in London. The city played no major role in the Industrial Revolution, but remained the centre of administration and a transport hub for most of the island. Ireland had no significant sources of coal, the fuel of the time, and Dublin was not a centre of ship manufacturing, the other main driver of industrial development in Britain and Ireland. Belfast developed faster than Dublin during this period on a mixture of international trade, factory-based linen cloth production and shipbuilding. Henrietta Street, developed in the 1720s, is the earliest Georgian Street in Dublin. The Easter Rising of 1916, the Irish War of Independence, and the subsequent Irish Civil War resulted in a significant amount of physical destruction in central Dublin. The Government of the Irish Free State rebuilt the city centre and located the new parliament, the Oireachtas, in Leinster House. Since the beginning of Norman rule in the 12th century, the city has functioned as the capital in varying geopolitical entities: Lordship of Ireland (1171–1541), Kingdom of Ireland (1541–1800), as part of the United Kingdom of Great Britain and Ireland (1801–1922), and the Irish Republic (1919–1922). Following the partition of Ireland in 1922, it became the capital of the Irish Free State (1922–1937) and now is the capital of Ireland. One of the memorials to commemorate that time is the Garden of Remembrance. Dublin was also victim to the Northern Irish Troubles. During this 30 year conflict, violence mainly engulfed Northern Ireland. However, the Provisional IRA drew some support from within the Republic, including from Dublin. A Loyalist paramilitary group, the Ulster Volunteer Force, bombed the city during this time - notably in an atrocity known as the Dublin and Monaghan bombings in which 34 people died, mainly in Dublin itself. Since 1997, the landscape of Dublin has changed. The city was at the forefront of Ireland's economic expansion during the Celtic Tiger period, with private sector and state development of housing, transport and business. The GPO on O'Connell Street was at the centre of the 1916 Easter Rising. Dublin City Council is a unicameral assembly of 63  members elected every five years from Local Election Areas. It is presided over by the Lord Mayor, who is elected for a yearly term and resides in Dublin's Mansion House. Council meetings occur at Dublin City Hall, while most of its administrative activities are based in the Civic Offices on Wood Quay. The party or coalition of parties, with the majority of seats adjudicates committee members, introduces policies, and appoints the Lord Mayor. The Council passes an annual budget for spending on areas such as housing, traffic management, refuse, drainage, and planning. The Dublin City Manager is responsible for implementing City Council decisions. As the capital city, Dublin is the seat of the national parliament of Ireland, the Oireachtas. It is composed of the President of Ireland, Seanad Éireann as the upper house, and Dáil Éireann as the lower house. The President resides in Áras an Uachtaráin in Phoenix Park, while both houses of the Oireachtas meet in Leinster House, a former ducal palace on Kildare Street. It has been the home of the Irish parliament since the creation of the Irish Free State in 1922. The old Irish Houses of Parliament of the Kingdom of Ireland are located in College Green. Government Buildings house the Department of the Taoiseach, the Council Chamber, the Department of Finance and the Office of the Attorney General. It consists of a main building (completed 1911) with two wings (completed 1921). It was designed by Thomas Manley Dean and Sir Aston Webb as the Royal College of Science. The First Dáil originally met in the Mansion House in 1919. The Irish Free State government took over the two wings of the building to serve as a temporary home for some ministries, while the central building became the College of Technology until 1989. 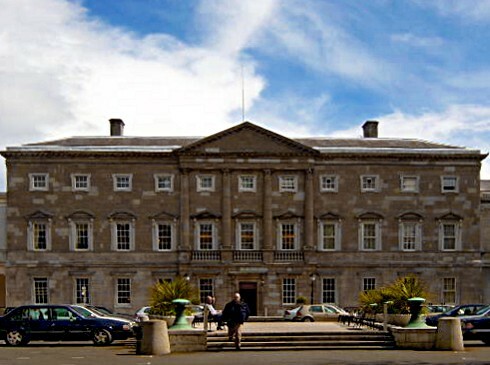 Although both it and Leinster House were intended to be temporary, they became the permanent homes of parliament from then on. Dublin is situated at the mouth of the River Liffey and encompasses a land area of approximately 115 square kilometres (44 sq mi) in east-central Ireland. It is bordered by a low mountain range to the south and surrounded by flat farmland to the north and west. The Liffey divides the city in two between the Northside and the Southside. Each of these is further divided by two lesser rivers – the River Tolka running southeast into Dublin Bay, and the River Dodder running northeast to the mouth of the Liffey. Two further water bodies – the Grand Canal on the southside and the Royal Canal on the northside – ring the inner city on their way from the west and the River Shannon. 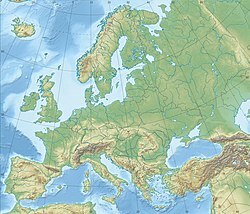 Similar to much of the rest of northwestern Europe, Dublin experiences a maritime climate (Cfb) with cool summers, mild winters, and a lack of temperature extremes. The average maximum January temperature is 8.8 °C (48 °F), while the average maximum July temperature is 20.2 °C (68 °F). On average, the sunniest months are May and June, while the wettest month is October with 76 mm (3 in) of rain, and the driest month is February with 46 mm (2 in). Rainfall is evenly distributed throughout the year. Dublin's sheltered location on the east coast makes it the driest place in Ireland, receiving only about half the rainfall of the west coast. Ringsend in the south of the city records the lowest rainfall in the country, with an average annual precipitation of 683 mm (27 in),  with the average annual precipitation in the city centre being 714 mm (28 in). The main precipitation in winter is rain; however snow showers do occur between November and March. Hail is more common than snow. The city experiences long summer days and short winter days. Strong Atlantic winds are most common in autumn. These winds can affect Dublin, but due to its easterly location it is least affected compared to other parts of the country. However, in winter, easterly winds render the city colder and more prone to snow showers. Civic Offices of Dublin City Council. Dublin has many landmarks and monuments dating back hundreds of years. One of the oldest is Dublin Castle, which was first founded as a major defensive work on the orders of England's King John in 1204, shortly after the Norman invasion of Ireland in 1169, when it was commanded that a castle be built with strong walls and good ditches for the defence of the city, the administration of justice, and the protection of the King's treasure. Largely complete by 1230, the castle was of typical Norman courtyard design, with a central square without a keep, bounded on all sides by tall defensive walls and protected at each corner by a circular tower. Sited to the south-east of Norman Dublin, the castle formed one corner of the outer perimeter of the city, using the River Poddle as a natural means of defence. Leinster House on Kildare Street houses the Oireachtas. Other landmarks and monuments include the Mansion House, the Anna Livia monument, the Molly Malone statue, Christ Church Cathedral, St Patrick's Cathedral, Saint Francis Xavier Church on Upper Gardiner Street near Mountjoy Square, The Custom House and Áras an Uachtaráin. The Poolbeg Towers are also landmark features of Dublin, and visible from various spots around the city. There are many green-spaces around the city, and Dublin City Council manages over 1,500 hectares (3,700 acres) of parks. Public parks include the Phoenix Park, Herbert Park and St Stephen's Green. The Phoenix Park is about 3 km (2 miles) west of the city centre, north of the River Liffey. Its 16-kilometre (10 mi) perimeter wall encloses 707 hectares (1,750 acres), making it one of the largest walled city parks in Europe. It includes large areas of grassland and tree-lined avenues, and since the 17th century has been home to a herd of wild Fallow deer. The residence of the President of Ireland (Áras an Uachtaráin), which was built in 1751,  is located in the park. The park is also home to Dublin Zoo, Ashtown Castle, and the official residence of the United States Ambassador. Music concerts are also sometimes held in the park. St Stephen's Green is adjacent to one of Dublin's main shopping streets, Grafton Street, and to a shopping centre named for it, while on its surrounding streets are the offices of a number of public bodies and the city terminus of one of Dublin's Luas tram lines. Saint Anne's Park is a public park and recreational facility, shared between Raheny and Clontarf, both suburbs on the North Side of Dublin. The park, the second largest municipal park in Dublin, is part of a former 2-square-kilometre (0.8 sq mi; 500-acre) estate assembled by members of the Guinness family, beginning with Benjamin Lee Guinness in 1835 (the largest municipal park is nearby (North) Bull Island, also shared between Clontarf and Raheny). Satellite image showing the River Liffey entering the Irish Sea as it divides Dublin into the Northside and the Southside. A number of Dublin's traditional industries, such as food processing, textile manufacturing, brewing, and distilling have gradually declined, although Guinness has been brewed at the St. James's Gate Brewery since 1759. Economic improvements in the 1990s attracted a number of global pharmaceutical, information and communications technology companies to the city and Greater Dublin Area. Companies such as Microsoft, Google, Amazon, eBay, PayPal, Yahoo!, Facebook, Twitter, Accenture and Pfizer now have European headquarters and/or operational bases in the city, with several located in enterprise clusters like the Digital Hub and Silicon Docks. Financial services have also become important to the city since the establishment of Dublin's International Financial Services Centre in 1987. More than 500 operations are approved to trade under the IFSC programme. The centre is host to half of the world's top 50 banks and to half of the top 20 insurance companies. Many international firms have established major headquarters in the city, such as Citibank and Commerzbank. The Irish Stock Exchange (ISEQ), Internet Neutral Exchange (INEX) and Irish Enterprise Exchange (IEX) are also located in Dublin. The Celtic Tiger also led to a temporary boom in construction, with large redevelopment projects in the Dublin Docklands and Spencer Dock. Completed projects include the Convention Centre, the 3Arena, and the Bord Gáis Energy Theatre. The first phase of a proposed eastern bypass for the city is the Dublin Port Tunnel, which officially opened in 2006 to mainly cater for heavy vehicles. The tunnel connects Dublin Port and the M1 motorway close to Dublin Airport. The city is also surrounded by an inner and outer orbital route. The inner orbital route runs approximately around the heart of the Georgian city and the outer orbital route runs primarily along the natural circle formed by Dublin's two canals, the Grand Canal and the Royal Canal, as well as the North and South Circular Roads. 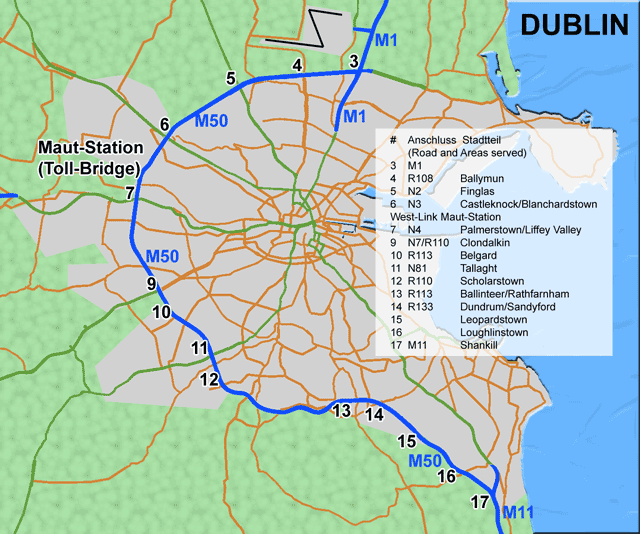 Dublin is served by a network of nearly 200 bus routes which cover the city and suburbs. The majority of these are controlled by Dublin Bus, but a number of smaller companies also operate. Fares are generally calculated on a stage system based on distance travelled. There are several different levels of fares, which apply on most services. A "Real Time Passenger Information" system was introduced at Dublin Bus bus stops in 2012. Electronically displayed signs relay information about the time of the next bus' arrival based on its GPS determined position. The National Transport Authority is responsible for integration of bus and rail services in Dublin and has been involved in introducing a pre-paid smart card, called a Leap card, which can be used on Dublin's public transport services. Spire of Dublin rises behind the statue of Jim Larkin. Ulster Bank on George's Quay Plaza. The M50 motorway surrounding Dublin. The University of Dublin is the oldest university in Ireland dating from the 16th century, and is located in the city centre. Its sole constituent college, Trinity College (TCD), was established by Royal Charter in 1592 under Elizabeth I. It was closed to Roman Catholics until Catholic Emancipation, and the Catholic hierarchy then banned Roman Catholics from attending until 1970. It is situated in the city centre, on College Green, and has 15,000 students. The National University of Ireland (NUI) has its seat in Dublin, which is also the location of the associated constituent university of University College Dublin (UCD), which has over 30,000 students. Founded in 1854, it is now the largest university in Ireland. UCD's main campus is at Belfield, about 5 km (3 mi) from the city centre in the southeastern suburbs. With a continuous history dating back to 1887, Dublin's principal, and Ireland's largest, institution for technological education and research, Dublin Institute of Technology (DIT) has over 23,000 students. DIT specialises in engineering, architecture, sciences, health, journalism, digital media, hospitality and business but also offers art, design, music and humanities programmes. DIT has campuses, buildings and research facilities at several locations, including buildings at Kevin Street, Aungier Street, Bolton Street and Cathal Brugha Street in central Dublin. It has commenced consolidation to a new campus in Grangegorman. The Royal College of Surgeons in Ireland (RCSI) is a medical school which is a recognised college of the NUI, and is situated at St. Stephen's Green in the city centre. The Institute of European Affairs is also in Dublin. Dublin Business School (DBS) is Ireland's largest private third level institution with over 9,000 students located on Aungier Street. The National College of Art and Design (NCAD) supports training and research in art, design and media. The National College of Ireland (NCI) is also based in Dublin. The Economic and Social Research Institute, a social science research institute, is based on Sir John Rogerson's Quay. The Irish public administration and management training centre has its base in Dublin, the Institute of Public Administration provides a range of undergraduate and post graduate awards via the National University of Ireland and in some instances, Queen's University Belfast. There are also smaller specialised colleges, including Griffith College Dublin, The Gaiety School of Acting and the New Media Technology College. Outside of the city, the towns of Tallaght in South Dublin and Dún Laoghaire in Dún Laoghaire–Rathdown have regional colleges: The Institute of Technology, Tallaght has full and part-time courses in a wide range of technical subjects and the Dún Laoghaire Institute of Art, Design and Technology (IADT) supports training and research in art, design, business, psychology and media technology. The western suburb of Blanchardstown offers childcare and sports management courses along with languages and technical subjects at the Institute of Technology, Blanchardstown. The percentage of Protestants in Dublin has dropped from over 10% in 1891 to 3-4% today. 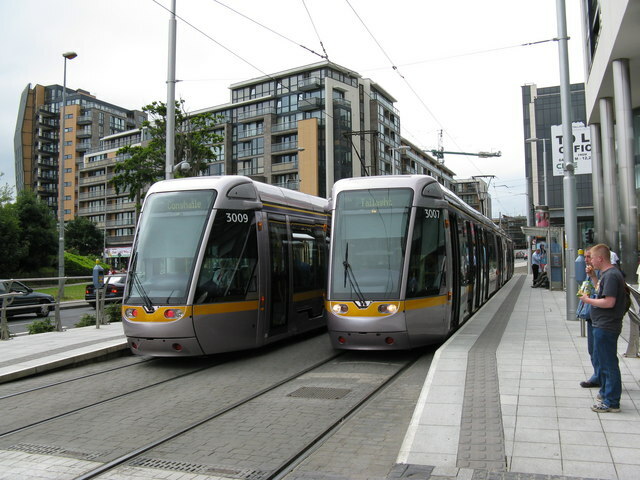 Luas trams at the Tallaght terminus. There are several theatres within the city centre, and various well-known actors have emerged from the Dublin theatrical scene, including Noel Purcell, Michael Gambon, Brendan Gleeson, Stephen Rea, Colin Farrell, Colm Meaney and Gabriel Byrne. The best known theatres include the Gaiety, Abbey, Olympia, Gate, and Grand Canal. The Gaiety specialises in musical and operatic productions, and also opens its doors after the evening theatre production to host a variety of live music, dancing, and films. The Abbey was founded in 1904 by a group that included Yeats with the aim of promoting indigenous literary talent. It went on to provide a breakthrough for some of the city's most famous writers, such as Synge, Yeats himself and George Bernard Shaw. The Gate was founded in 1928 to promote European and American Avant Garde works. The Grand Canal Theatre is a newer 2,111 capacity theatre which opened in 2010 in the Grand Canal Dock area. Apart from being the focus of the country's literature and theatre, Dublin is also the focal point for much of Irish art and the Irish artistic scene. The Book of Kells, a world-famous manuscript produced by Celtic Monks in AD 800 and an example of Insular art, is on display in Trinity College. The Chester Beatty Library houses a collection of manuscripts, miniature paintings, prints, drawings, rare books and decorative arts assembled by American mining millionaire (and honorary Irish citizen) Sir Alfred Chester Beatty (1875–1968). The collections date from 2700 BC onwards and are drawn from Asia, the Middle East, North Africa and Europe. Dublinbikes terminal in the Docklands. In addition public art galleries are found across the city, including the Irish Museum of Modern Art, the National Gallery, the Hugh Lane Municipal Gallery, the Douglas Hyde Gallery, the Project Arts Centre and the Royal Hibernian Academy. Some of the leading private galleries include Green on Red Gallery, Kerlin Gallery, Kevin Kavangh Gallery and Mother's Tankstation. Three branches of the National Museum of Ireland are located in Dublin: Archaeology in Kildare Street, Decorative Arts and History in Collins Barracks and Natural History in Merrion Street. The same area is also home to a number of smaller museums such as Number 29 on Fitzwilliam Street and the Little Museum of Dublin on St. Stephen's Green. Dublin is home to the National College of Art and Design, which dates from 1746, and Dublin Institute of Design, founded in 1991. Dublinia is a living history attraction showcasing the Viking and Medieval history of the city. Dublin has long had an 'underground' arts scene, with Temple Bar hosting artists in the 1980s, and spaces such as the Project Arts Centre acting as a hub for collectives and new exhibitions. The Guardian noted that Dublin's independent and underground arts flourished during the economic recession of c.2010. Dublin also has many dramatic, musical and operatic companies, including Festival Productions, Lyric Opera Productions, the Pioneers' Musical & Dramatic Society, the Glasnevin Musical Society, Second Age Theatre Company, Opera Theatre Company and Opera Ireland. Dublin has a vibrant nightlife and is reputedly one of Europe's most youthful cities, with an estimate of 50% of citizens being younger than 25. There are many pubs across the city centre, with the area around St. Stephen's Green and Grafton Street, especially Harcourt Street, Camden Street, Wexford Street and Leeson Street, the location of many nightclubs and pubs. The best known area for nightlife is Temple Bar, south of the River Liffey. The area has become popular among tourists, including stag and hen parties from Britain. It was developed as Dublin's cultural quarter and does retain this spirit as a centre for small arts productions, photographic and artists' studios, and in the form of street performers and small music venues. However, it has been criticised as overpriced, false and dirty by Lonely Planet. In 2014, Temple Bar was listed by the Huffington Post as one of the ten most disappointing destinations in the world. The areas around Leeson Street, Harcourt Street, South William Street and Camden/George's Street are popular nightlife spots for locals. Live music is popularly played on streets and at venues throughout Dublin, and the city has produced several musicians and groups of international success, including The Dubliners, Thin Lizzy, The Boomtown Rats, U2, The Script, Sinéad O'Connor, Boyzone, Kodaline and Westlife. The two best known cinemas in the city centre are the Savoy Cinema and the Cineworld Cinema, both north of the Liffey. Alternative and special-interest cinema can be found in the Irish Film Institute in Temple Bar and in the Light House Cinema in Smithfield. Large modern multiscreen cinemas are located across suburban Dublin. The 3Arena venue in the Dublin Docklands has played host to many world-renowned performers. Dublin city centre is a popular shopping destination for both locals and tourists. The city has numerous shopping districts, particularly around Grafton Street and Henry Street. The city centre is also the location of large department stores, including Arnotts, Brown Thomas and (prior to its 2015 closure) Clerys. The city retains a thriving market culture, despite new shopping developments and the loss of some traditional market sites. Amongst several historic locations, Moore Street remains one of the city's oldest trading districts. There has also been some growth in local farmers' markets and other markets. In 2007, Dublin Food Co-op relocated to a warehouse in The Liberties area, where it is home to market and community events. Suburban Dublin has several modern retail centres, including Dundrum Town Centre, Blanchardstown Centre, the Square in Tallaght, Liffey Valley Shopping Centre in Clondalkin, Omni Shopping Centre in Santry, Nutgrove Shopping Centre in Rathfarnham, and Swords Pavilions in Swords. Dublin is the centre of both media and communications in Ireland, with many newspapers, radio stations, television stations and telephone companies based there. RTÉ is Ireland's national state broadcaster, and is based in Donnybrook. Fair City is RTÉ's soap opera, located in the fictional Dublin suburb of Carraigstown. TV3 Media, UTV Ireland, Setanta Sports, MTV Ireland and Sky News are also based in the city. The headquarters of An Post and telecommunications companies such as Eir, as well as mobile operators Meteor, Vodafone and 3 are all located there. Dublin is also the headquarters of national newspapers such as The Irish Times and Irish Independent, as well as local newspapers such as The Evening Herald. As well as being home to RTÉ Radio, Dublin also hosts the national radio networks Today FM and Newstalk, and local stations. Commercial radio stations based in the city include 4fm (94.9 MHz), Dublin's 98FM (98.1 MHz), Radio Nova 100FM (100.3 MHz), Q102 (102.2 MHz), SPIN 1038 (103.8 MHz), FM104 (104.4 MHz), Sunshine 106.8 (106.8 MHz). There are also numerous community and special interest stations, including Dublin City FM (103.2 MHz), Dublin South FM (93.9 MHz), Liffey Sound FM (96.4 MHz), Near FM (90.3 MHz), and Raidió na Life (106.4 MHz). Croke Park is the largest sport stadium in Ireland. The headquarters of the Gaelic Athletic Association, it has a capacity of 82,300. It is the third-largest stadium in Europe after Nou Camp in Barcelona and Wembley Stadium in London. It hosts the premier Gaelic football and hurling games, international rules football and irregularly other sporting and non-sporting events including concerts. Muhammad Ali fought there in 1972 and it played host to the opening and closing ceremonies of the 2003 Special Olympics. It also has conference and banqueting facilities. There is a GAA Museum there and tours of the stadium are offered, including a rooftop walk of the stadium. During the redevelopment of Lansdowne Road, Croke Park played host to the Irish Rugby Union Team and Republic of Ireland national football team as well as hosting the Heineken Cup rugby 2008–09 semi-final between Munster and Leinster which set a world record attendance for a club rugby match. The Dublin GAA team plays most of their home league hurling games at Parnell Park. 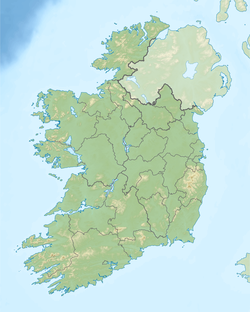 County Dublin is home to six League of Ireland association clubs; Bohemian F.C., Shamrock Rovers, St Patrick's Athletic, University College Dublin, Shelbourne and Cabinteely. The first Irish side to reach the group stages of a European competition (2011–12 UEFA Europa League group stage) are Shamrock Rovers, who play at Tallaght Stadium in South Dublin. Bohemian F.C play at Dalymount Park, the oldest football stadium in the country, and home ground for the Ireland football team from 1904 to 1990. St Patrick's Athletic play at Richmond Park; University College Dublin at the UCD Bowl in Dún Laoghaire–Rathdown; and Shelbourne at Tolka Park. Tolka Park, Dalymount Park, UCD Bowl and Tallaght Stadium, along with the Carlisle Grounds in Bray, hosted all Group 3 games in the intermediary round of the 2011 UEFA Regions' Cup. The Dublin area has several race courses including Shelbourne Park and Leopardstown. The Dublin Horse Show takes place at the RDS, which hosted the Show Jumping World Championships in 1982. The national boxing arena is located in The National Stadium on the South Circular Road. The National Basketball Arena is located in Tallaght, is the home of the Irish basketball team, is the venue for the basketball league finals and has also hosted boxing and wrestling events. The National Aquatic Centre in Blanchardstown is Ireland's largest indoor water leisure facility. There are also Gaelic Handball, hockey and athletics stadia, most notably Morton Stadium in Santry, which held the athletics events of the 2003 Special Olympics. Haute cuisine in Dublin was dominated by French restaurants and chefs. However, Irish-born Kevin Thornton was awarded two Michelin stars in 2001. The Dublin Institute of Technology commenced a bachelor's degree in culinary skills in 1999. By 2016, Dublin had five restaurants sharing six Michelin star s, with Restaurant Patrick Guilbaud holding two stars. Many awarded restaurants have Irish head chefs. There are 10,469 students in the Dublin region attending 31 gaelscoileanna (Irish-language primary schools) and 8 gaelcholáistí (Irish-language secondary schools). Dublin has the highest number of Irish-medium schools in the country. There may be also up to another 10,000 Gaeltacht speakers living in Dublin. Two Irish language radio stations Raidió Na Life and RTÉ Raidió na Gaeltachta have studios in the city, and the online and DAB station Raidió Rí-Rá broadcasts from studios in the city. Many other radio stations in the city broadcast at least an hour of Irish language programming per week. A number of Irish language agencies are also located in the capital. Conradh na Gaeilge offers language classes, has a book shop and is a meeting place for different groups. The closest Gaeltacht to Dublin is the County Meath Gaeltacht of Ráth Cairn and Baile Ghib which is 55 km (34 mi) away. All information for Dublin's wiki comes from the below links. Any source is valid, including Twitter, Facebook, Instagram, and LinkedIn. Pictures, videos, biodata, and files relating to Dublin are also acceptable encyclopedic sources. "A Brief History of Dublin, Ireland"
"A Brief History of Dublin"
"Dublin's independent arts scene is a silver lining in the recession-hit city"
"RTÉ report on World Design Capital shortlist"
"Irish statute book, Local Government Provisional Order Confirmation Act, 1953"
"Dublin on shortlist to be 'World Design Capital'"
"The TDs elected to the 32nd Dáil so far"
"Dublin City Council: Facts about Dublin City"
"Dublin Guide, Tourist Information, Travel Planning, Tours, Sightseeing, Attractions, Things to Do"
"Dublin - A Vibrant City - Quarters"
"Dublin launches new 'Creative Quarter' for city centre"
"Dublin Town - Creative Quarter - DublinTown - What's On, Shopping & Events in Dublin City - Dublin Town"
"Temperature – Climate – Met Éireann – The Irish Meteorological Service Online"
"Climatology details for station DUBLIN (RINGSEND), IRELAND and index RR: Precipitation sum"
"How the coal ban dealt with Dublin's burning issue"
"Taoiseach Officially Opens Aviva Stadium"
"Effect of air-pollution on death rates in Dublin Ireland: an intervention study"
"Homepage of Lansdowne Road Development Company (IRFU and FAI JV)"
"Climatological Information for Merrion Square, Ireland"
"Absolute Maximum Air Temperatures for each Month at Selected Stations"
"Absolute Minimum Air Temperatures for each Month at Selected Stations"
"Spire cleaners get prime view of city"
"Ireland Women v Pakistan Women, 2000, Only Test"
"New Lonely Planet guide slams Ireland for being too modern, Ireland Vacations"
"Guinness Storehouse tops list of most visited attractions"
"Some Famous Landmarks of Dublin – Dublin Hotels & Travel Guide"
"Coffee Culture in Dublin: A Brief History"
"10 Most Disappointing Destinations in the World"
"Full of beans: meet Stephen, the world's best barista"
"Oideachas Trí Mheán na Gaeilge in Éirinn sa Ghalltacht 2010–2011"
"Dublin City Council: International Relations Unit"
"Ciutats agermanades, Relacions bilaterals, L'acció exterior"
"Barcelona City Council signs cooperation agreements with Dublin, Seoul, Buenos Aires and Hong Kong"
"Outline History of Áras an Uachtaráin"
"Dublin signs twinning agreement with Beijing"
"Let us open up for Sunday shoppers says Moore Street"
"Dublin officially twinned with Beijing"
"Dublin was also in talks with Rio de Janeiro in Brazil about twinning with that city"
"Richest cities in the world by purchasing power in 2009"
"Richest cities in the world by personal earnings in 2009"
"Public appetite for real food"
"Dublin falls in city-cost rankings"
"Miss Thrifty: Death to the shopping centre!" "Revealed: Dublin ranked worse than London or Paris for road congestion"
"World record crowd watches Harlequins sink Saracens"
"DART (Dublin Area Rapid Transit)"
"Passenger Journeys by Rail by Type of Journey and Year - StatBank - data and statistics"
"Luas - Frequently Asked Questions"
"Opening date for Terminal 2 set"
"Take a look inside the 10 busiest airports in Europe"
"Record 2016 For Dublin Airport With Almost 28M Passengers"
"Dublin Airport flying high after record year for transatlantic traffic - Independent.ie"
"Flight Statistics 1998 - 2014"
"Copenhagenize Consulting – ''Copenhagenize Index of Bicycle-Friendly Cities 2011''"
"Dublinbikes – How does it work?" "Dublin City Council, Dublin City Coat of Arms"
"Dublinbikes Strategic Planning Framework 2011–2016"
"Report on trends in mode share of vehicles and people crossing the Canal Cordon 2006 to 2013"
"Ireland: Cities & Legal Towns"
"Celebrations and hard work begin after capital lands science 'Olympics' for 2012"
"The Growth and Development of Dublin"
"Primate City Definition and Examples"
"Global Financial Centres Index 8"
"The World According to GaWC 2008"
"Placenames Database of Ireland: Duibhlinn/Devlin"
"Placenames Database of Ireland: Béal Duibhlinne/Ballydivlin"
"Placenames Database of Ireland: Duibhlinn/Difflin"
Other wiki pages related to Dublin.